Microsoft Windows 8, Windows 8 Pro, Windows 8 RT Features Comparison Chart - Which Windows 8 Version is Right for You? Microsoft Windows 8 has been released with its three official Stock-Keeping Unit's (SKU's) Editions including Windows 8, Windows 8 Pro and Windows 8 RT and Microsoft has already launches and integrated its latest Windows 8 Operating System on upcoming Desktop Computers, Laptops, Notebooks, Tablets and Smartphones but if you're one of those who are using old Desktop Computers and Laptops or any other device and thinking to divert or switch to one of those Official Windows 8 SKU's Editions i.e. 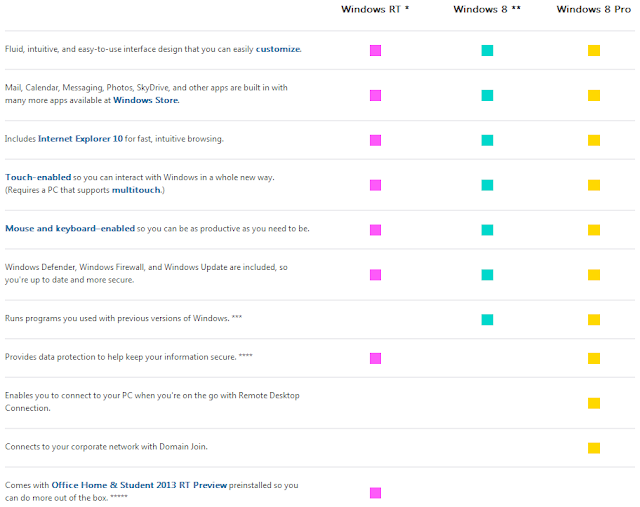 Windows 8, Windows 8 Pro and Windows 8 RT versions and if you're not sure Which Windows 8 Edition is Right for You? Either its Windows 8 Pro or Windows 8 RT or simple Windows 8 edition? But not now we are going to answer all your questions and confusions in our today’s article which will guide you to choose Best Edition of Windows 8 according to your needs. Following Features Comparison Chart of Microsoft Windows 8, Windows 8 Pro and Windows 8 RT will let you decide and choose amongst Best Editions of Windows 8. So if you're going to purchase new DVD of Windows 8, Windows 8 Pro and Windows 8 RT or if you're thinking to upgrade your current old Windows version or if you're going to purchase new Desktop Computers, Laptops, Notebooks, Tablets and Smartphones with Windows 8 pre-installed our following Infographic Chart of Microsoft Windows 8, Windows 8 Pro, Windows 8 RT Features Comparison will helps you to take your decision according to your choice and needs. 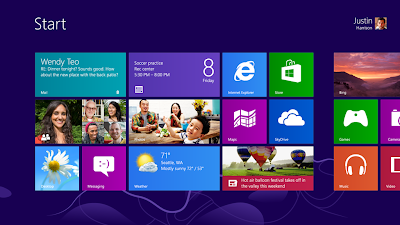 It will also let you know the Difference between Windows 8, Windows 8 Pro and Windows RT Editions Features and Programs.